It is not often that one gets the opportunity to dine with European nobility, but the Royal Cliff’s de Vine Wine Club, along with Ron Batori’s Bangkok Beer and Beverage, made it possible, with a wine dinner featuring Frescobaldi wines, and overseen by the Marchesi de Frescobaldi himself. The Marchesi, who is the President of Frescobaldi Wines, when asked how he should be addressed, smiled broadly and said “Lamberto”! And the full house of members and guests were also smiling broadly, even before the dinner began. 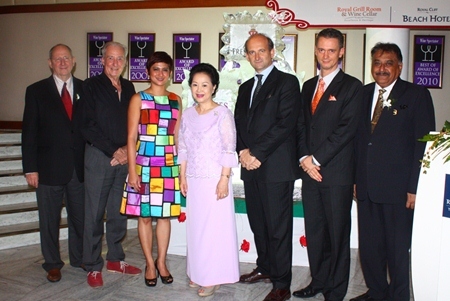 (Front row) Christoph Voegeli, Panga Vathanakul, Marchesi de Frescobaldi; (back row) Chan Vathanakul, Mrs Sripasert, Virach Sriprasert. The reason being that the reception was held in the outdoor Sunset Lobby terrace adjoining the Grill Room and Wine Cellar and featured Prosecco and fresh oysters with vodka foam! That’s what I call a five star starter! The evening was opened with the Royal Cliff’s GM Christoph Voegeli welcoming everyone and introducing the Marchesi to the diners. Lamberto spoke on his concepts of ‘Vision and Tradition’, and for someone representing over 700 years of wine making in his family, he certainly had the tradition. He was even living in a house built by one of his ancestors in the 1500’s, though he did say they had added air-conditioning since then. 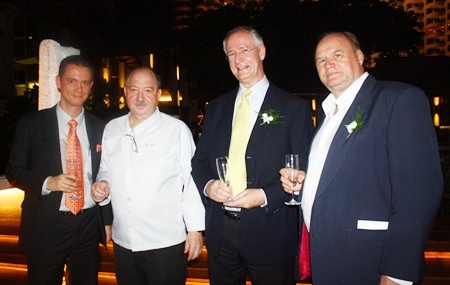 (L to R) General Manager Christoph Voegeli, Executive Chef Walter Thenisch, Dieter Reigber, president of the Rotary Club of Pattaya-Jomtien and Dr. Jan Chris Von Koss. As part of his vision, he said that “wine needs to be drunk in moderation.” This was a vision that came to him when he was six years old. Despite the family history, he also covered tradition by saying, “Don’t fall in love with the past.” Under his watch, the family is certainly looking forwards, not backwards. Poached Maine lobster tail with crab meat and salsa verde with Bianca Balsamico flavored frisee salad. The Frescobaldi winery, which is in Tuscany, covers nine different estates, and they have kept each as a self-determining unit, with the objective being to allow the drinkers of their wines to appreciate the difference between one wine and another. As an interesting sidelight, the Marchesi spoke on the problems the industry has with fake wines, citing bottles of 1986 Petrus found in the US, which had the correct bottle, but the wrong contents! 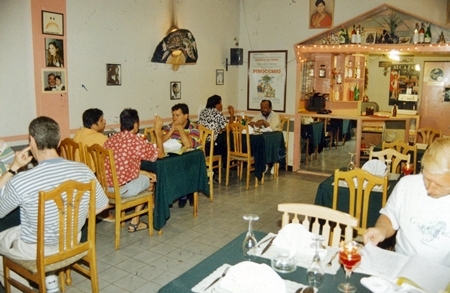 (L to R) Ron Batori, Dr. Iain Corness, Manantana Chaisamut, Panga Vathanakul, Lamberto Frescobaldi, Christoph Voegeli, and Pratheep Malhotra. And so to the dinner itself. The first course was an amazing dinner plate with something that looked as if Jackson Pollock had arranged the different items on it. A poached Maine lobster tail with crab meat and salsa verde with Bianca Balsamico flavored frisee salad, eaten with a very smooth white wine being the Pomino Bianco, Rufino DOC, Marchesi de Frescobaldi, 2011. 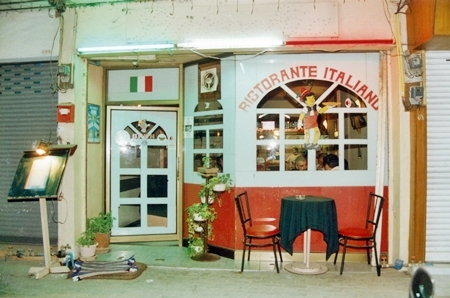 The wine uses predominantly Chardonnay and Pinot Bianco grapes, and though still young was universally enjoyed. The second course was a ravioli style, with chestnut filled cappellacci pasta on a pumpkin sauce. The wine chosen to accompany this was a Remole, Toscana IGT, 2010. This was another very smooth red wine, made from mainly Sangiovese with some Cabernet Sauvignon and another universally enjoyed. The third course had a mixed response from the diners. It was a crispy pork belly filled with apple, onion and pancetta on a prune reduction with warm lentil chutney. For me, the filling was very enjoyable, but the pork belly I found a little fatty. The wine was a Castiglioni, Chianti DOCG from Sangiovese and Merlot grapes. This vineyard has been owned by the Frescobaldi family since the 11th century, and again very enjoyable. And so to the main course which was a baked (Australian) Victorian rack of lamb in a porcini mushroom crust, vegetable fry, Parmesan potato crisp and truffle oil vinaigrette. A wonderful dish! Two wines were served with this, allowing direct comparison. The first was a Nipozzani Riserva, Chianti Rufina Riserva, DOCG, 2008 made with the Sangiovese grape and a Tenuta Frescobaldi di Castiglioni, Toscana IGT, also 2008 made from Cabernet Sauvignon, Merlot, Cabernet Franc and Sangiovese. Most of the men preferred the former and the women the latter. No wine can ever be all things for all people! The dessert was an amazing collection of chocolate calories offset with a Dolce Sandi NV. The Royal Cliff’s de Vine Wine Club provided its members and guests with an excellent and different evening, showing the depth and history of wine making in Italy, especially from Tuscany. Christoph Voegeli said that the next wine dinner would be in February 2013. Book your seats now! Next articleWho is responsible for digging holes in the roads?